Steve Freeman of the Republican Socialist Alliance comments on the meeting on James Connolly and the 1916 Rising held by the Wakefield Socilaist History Group in the Red Shed on Saturday, September 3rd. Last Saturday the Wakefield Socialist History group held a very interesting and informative meeting on James Connolly and the 1916 Easter uprising. A range of speakers, Rayner O’Connor Lysaght, Allan Armstrong, Robin Stocks, Bernie McAdam and Adam Buick, highlighted different perspectives on these events. Connolly is usually seen in an Irish context. His roots and involvement in the Edinburgh working class movement is either forgotten or ignored. Allan Armstrong’s research and talk was rebalancing our appreciation of Connolly’s politics for Scottish republican socialism today. Nevertheless it was in Ireland that republican socialism established its credentials. The declaration of the Irish republic on the steps of the Dublin post office was the trigger for the Irish democratic revolution. For Connolly, achieving a republic was the beginning of the revolution not its final act. Republican socialism is the republican road to socialism. The relationship between republicanism and socialism is transitional. Achieving a republic opens the door to social transformation. Winning a republic is not a single event but a highly contested battleground which does not guarantee the victory of the social revolution. This much connects Connolly to Lenin. In 1916 Connolly tried to establish a republic and failed. In February 1917 the republic was won by Russian workers and Lenin returned to Russia determined to make a republic capable of moving towards socialism. Republican socialism is alien to the left in England. ‘Labourism’ or British reformism is connected with the Fabian idea of gradualism. A republican break with the old order is not necessary. The present political laws and institutions of the Crown-in-Parliament are not a barrier to socialism but the means of achieving it. Hence Keir Hardie was not a republican socialist. Like Jeremy Corbyn today, he was a republican and a socialist. In England these are two separate and disconnected policies. In Ireland Connolly fused them into a single strategy. Connolly was accused by Fabians and ultra left sectarians of abandoning socialism for national revolution. They labelled him a petty ‘nationalist’. Lenin rejected that. He understood the internationalist implications of the 1916 Easter uprising. In the middle of an imperialist war, in the year of the mass slaughter on the Somme, the Irish rebels were beginning a European democratic revolution which would spread to Russia and Germany. The Irish uprising was not just an Irish event or even the start of a European revolution. It was a revolt within the UK. Marx saw a direct link between revolution in Ireland and in England. Ireland was not simply a British colony like India, or those in the Middle East and Africa. Ireland was directly part of the UK state and constitution. Democratic demands and struggles in Ireland, like Scotland today, are therefore destabilising and dangerous for the ruling class. 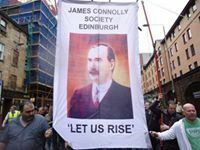 James Connolly’s republican socialism, like Connolly himself, is a bridge between Ireland and Scotland today. In 2014 the Scottish people were mobilising for democratic change. The referendum result halted them in their tracks. Two years later nothing is resolved. But the rise of the SNP, support for Corbyn and the Brexit vote has made it game on once again. What kind of sovereignty do we need, where are we going to find it and how can we get our hands on it? The EU referendum promised sovereignty for the people. But it has served to highlight divisions in a broken Westminster system. England and Wales voted to leave the EU and Scotland and Northern Ireland voted to remain. The right to self determination means that the Scottish and Irish people have a right and a reason to leave the UK and negotiate to remain in the EU. Prime Minister May emphasised that “Brexit means Brexit”. Yet the unintended consequences of Cameron’s EU referendum gamble may be that Brexit comes to mean ‘Exit from Britain’. In 1916 Ireland was the first place to try this kind of ‘Brexit’. Today Northern Ireland and Scotland may join the queue to the exit door. It would be ironic if the triumph for UK Independence turned the UK into Little England and Wales. It is not what Cameron, UKIP or the Tory Party intended.